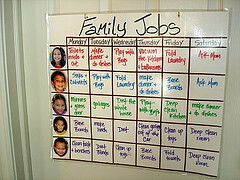 Peter Abilla over at the Shmula blog recently described how he uses visual management techniques to help his five kids become productive members of the family. While many families use similar techniques, even if they are scribbles on the fridge, Peter leverages the lean manufacturing aspects of the technique. One area of life-skills that my wife and I are focused on in teaching our children, is teaching them the principle of work: how to work, the value of work, to take ownership over their responsibilities, and to be proud of their accomplishments, and to learn to work as a team and family. One way we are reinforcing the principle of work is through the use of effective Visual Management. He goes on to describe the components of an effective visual management system. The result is on the right. Another unique aspect of Peter’s implementation: it involved a Deming PDCA style method, beginning with a planned end-of-yeaar meeting, developing the plan, communicating the plan, checking how the implementation is working, and adjusting based on how it is working. In true lean fashion, it includes the oft-forgotten second pillar: respect for people. Or respect for kids in this case. And his family is looking at even more improvements centered around standard work. What we haven’t done yet is to provide Standard Work Cards for each job, showing in text how to do the job and also a picture of what a "good job" looks like. One example might be to show a side-by-side comparison of a dirty toilet next to a clean toilet, with a marker on the clean toilet, indicating to the reader what the ideal finished good should look like. Sounds like a great idea, but I can’t really comment much as I’m not a parent. Does it work? Any comments? Peter is asking for them on his blog.